For other ships with the same name, see USS Enterprise (disambiguation). 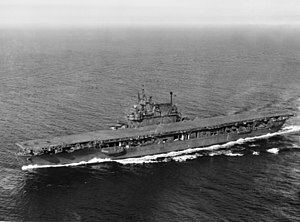 USS Enterprise (CV-6) was the seventh U.S. Navy vessel to bear the name. Colloquially called "The Big E", she was the sixth aircraft carrier of the United States Navy. A Yorktown-class carrier, she was launched in 1936 and was one of only three American carriers commissioned before World War II to survive the war (the others being Saratoga and Ranger). She participated in more major actions of the war against Japan than any other United States ship. These actions included the Attack on Pearl Harbor (18 dive bombers of VS-6 were over the harbor; 6 were shot down with a loss of 11 men—she was the only American aircraft carrier with men at Pearl Harbor during the attack and the first to sustain casualties during the Pacific War), the Battle of Midway, the Battle of the Eastern Solomons, the Battle of the Santa Cruz Islands, various other air-sea engagements during the Guadalcanal Campaign, the Battle of the Philippine Sea, and the Battle of Leyte Gulf. Enterprise earned 20 battle stars, the most for any U.S. warship in World War II, and was the most decorated U.S. ship of World War II. She is also the first American ship to sink an enemy warship during the Pacific War when she sank Japanese submarine I-70 on 10 December 1941. On three occasions during the Pacific War, the Japanese announced that she had been sunk in battle, inspiring her nickname "The Grey Ghost". The second carrier of the Yorktown-class, Enterprise was launched on 3 October 1936 at Newport News Shipbuilding, sponsored by Lulie Swanson, wife of Secretary of the Navy Claude A. Swanson, and commissioned on 12 May 1938 with Captain Newton H. White, Jr. in command. Enterprise sailed south on a shakedown cruise which took her to Rio de Janeiro. Captain Charles A. Pownall relieved White on 21 December. After her return, she operated along the east coast and in the Caribbean until April 1939, when she was ordered to duty in the Pacific. Enterprise was one of fourteen ships to receive the early RCA CXAM-1 radar. Captain George D. Murray assumed command of the carrier on 21 March 1941. Based first at San Diego (where she was used in the filming of Dive Bomber, starring Errol Flynn and Fred MacMurray) and then at Pearl Harbor after President Roosevelt ordered the Fleet to be "forward based," the carrier and her aircraft squadrons trained intensively and transported aircraft among the island bases of the Pacific. Enterprise was completing one such mission when she left Pearl Harbor on 28 November 1941. It was while returning to Hawaii after delivering Marine Fighter Squadron 211 (VMF-211) to Wake Island, when the Japanese attacked Pearl Harbor on December 7. Enterprise was at sea on the morning of 7 December 1941 and received a radio message from Pearl Harbor, reporting that the base was under attack. The next evening, Enterprise, screened by six of her Grumman F4F Wildcat fighters, put into Pearl Harbor for fuel and supplies. VADM Halsey ordered every able bodied man on board to help rearm and refuel Enterprise, the entire 24-hour process took only 7 hours. The aircraft were fired on by anti-aircraft defenses, and one pilot radioed in, reporting that his aircraft was an American aircraft. She sailed early the next morning to patrol against possible additional attacks in the Hawaiian Islands. Although the group encountered no surface ships, Enterprise aircraft sank Japanese submarine I-70 at 23°45′N 155°35′W﻿ / ﻿23.750°N 155.583°W﻿ / 23.750; -155.583﻿ (USS Enterprise sinks I-70) on 10 December 1941. During the last two weeks of December 1941, Enterprise and her group steamed west of Hawaii to cover the islands while two other carrier groups made a belated attempt to relieve Wake Island. After a brief layover at Pearl Harbor, Enterprise and her group sailed on 11 January, protecting convoys reinforcing Samoa. On 16 January 1942, one of her TBD Devastators of Torpedo Squadron 6 (VT-6), piloted by Chief Harold F. Dixon, got lost on patrol, ran out of fuel, and ditched. Dixon and his two crewmates, bombardier Anthony J. Pastula and gunner Gene Aldrich, survived for 34 days in a small rubber raft that had no stored food or water, before drifting ashore on Pukapuka atoll. Dixon was awarded the Navy Cross for "extraordinary heroism, exceptional determination, resourcefulness, skilled seamanship, excellent judgment and highest quality of leadership." On 1 February, Enterprise's Task Force 8 raided Kwajalein, Wotje, and Maloelap in the Marshall Islands, sinking three ships, damaging eight, and destroying numerous airplanes and ground facilities. Enterprise received only minor damage in the Japanese counterattack, as her group retired to Pearl Harbor. The next month, Enterprise and her group swept the central Pacific, attacking enemy installations on Wake and Marcus Islands. After minor alterations and repairs at Pearl Harbor, Enterprise departed on 8 April 1942 to rendezvous with her sister ship Hornet and sail west, escorting Hornet on the mission to launch 16 Army B-25 Mitchells in the "Doolittle Raid" on Tokyo. While fighters from Enterprise flew combat air patrol, the B-25s launched on 18 April, and flew undetected the remaining 600 miles (1,000 km) to the target. The task force, its presence known to the enemy after a sighting by small vessels, reversed course and returned to Pearl Harbor on 25 April. Five days later, Enterprise sortied toward the South Pacific to reinforce U.S. carriers operating in the Coral Sea. However, the Battle of the Coral Sea was over before Enterprise arrived. After executing, with Hornet, a feint towards Nauru and Banaba (Ocean) islands which caused the Japanese to delay Operation RY to seize the two islands, Enterprise returned to Pearl Harbor on 26 May, and began intensive preparation to meet the expected Japanese thrust at Midway Island. On 28 May, Enterprise sortied as Rear Admiral Raymond A. Spruance's flagship with orders "to hold Midway and inflict maximum damage on the enemy by strong attrition tactics". With Enterprise in CTF 16 were Hornet, six cruisers, and 10 destroyers. On 30 May, Task Force 17 (TF17), with Rear Admiral Frank J. Fletcher in Yorktown, left Pearl with two cruisers and six destroyers as CTF-17; as senior officer present, Rear Admiral Fletcher became "Officer in Tactical Command." The usual commander of Enterprise's task force, Vice Admiral William F. "Bull" Halsey, was kept in hospital at Pearl with a stress-related skin condition. Each side launched air attacks during the day in a decisive battle. Though the forces were in contact until 7 June, by 10:45am on 4 June the outcome had been decided. Three Japanese carriers were burning and it was only a matter of time until a fourth was caught and knocked out. The Battle of Midway began on the morning of 4 June 1942, when four Japanese carriers, unaware of the presence of U.S. naval forces, launched attacks on Midway Island. Shortly after the first bomb fell on Midway, the first wave of planes (4 B-26B Marauders, 6 TBF-1 Avengers,11 SB2U-3s, 16 SBDs and 15 B-17s) from Midway Island attacked, unsuccessfully. Several more groups attacked, again failing to damage their targets. Planes from the U.S. carriers attacked next. Enterprise torpedo bombers attacked first, scoring no hits and suffering heavy losses. Soon after, Enterprise dive bombers attacked and disabled the Japanese carriers Kaga and Akagi, leaving them ablaze. Within an hour, the one remaining Japanese carrier, Hiryu, launched air strikes that crippled Yorktown with three bombs and two torpedoes striking home during two separate attacks. In late afternoon, a mixed squadron of Enterprise and Yorktown bombers, flying from Enterprise, disabled Hiryu, leaving her burning. (Aircraft from Yorktown had also disabled the Japanese aircraft carrier Sōryū at the same time as Enterprise planes were bombing Akagi and Kaga, again leaving it burning and dead in the water). The following day Enterprise dive bombers alone sank cruiser Mikuma. While Yorktown and Hammann were the only American ships sunk, TF 16 and TF 17 lost a total of 113 planes, 61 of them in combat, during the battle. Japanese losses were much larger: four carriers (all scuttled), one cruiser and 272 carrier aircraft. Despite losses to her aircraft squadrons, Enterprise came through undamaged and returned to Pearl Harbor on 13 June 1942. Near hit during the Battle of the Santa Cruz Islands, 26 October 1942. Captain Arthur C. Davis relieved Murray on 30 June 1942. After a month of rest and overhaul, Enterprise sailed on 15 July 1942 for the South Pacific, where she joined TF 61 to support the amphibious landings in the Solomon Islands on 8 August. For the next two weeks, the carrier and her planes guarded seaborne communication lines southwest of the Solomons. On 24 August, a strong Japanese force was discovered some 200 miles (300 km) north of Guadalcanal, and TF 61 sent planes to the attack. This was the first time that the Grim Reapers of VF-10 deployed from Enterprise under commanding officer James H. Flatley, who became known as "Reaper Leader." In the ensuing Battle of the Eastern Solomons, the light carrier Ryūjō was sunk, and the Japanese troops intended for Guadalcanal were forced back. Enterprise suffered most heavily of the American ships; three direct bomb hits and four near misses killed 74, wounded 95, and inflicted serious damage on the carrier. Quick, hard work by damage control parties patched her up so that she was able to return to Hawaii under her own power. Repaired at Pearl Harbor from 10 September–16 October 1942, Enterprise departed once more for the South Pacific, where with Hornet she formed TF 61, although Captain Osborne Hardison relieved Davis on 21 October. Five days later, Enterprise scout planes located a Japanese carrier force and the Battle of the Santa Cruz Islands was under way. 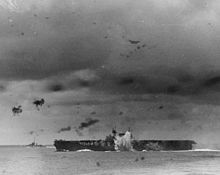 Enterprise aircraft struck carriers and cruisers during the struggle, while the ship herself underwent intensive attack. Hit twice by bombs, Enterprise lost 44 men and had 75 wounded. Despite serious damage, she continued in action and took on board a large number of planes and crewmen from Hornet when that carrier was sunk. Though the American losses of a carrier and a destroyer were more severe than the Japanese loss of one light cruiser, the battle gained time to reinforce Guadalcanal against the next enemy onslaught, and nearby Henderson Field was therefore secure from the Japanese bombardment. The loss of Hornet meant Enterprise was now the only functioning (albeit damaged) US carrier in the Pacific Theater. [note 1] On the flight deck, the crew posted a sign: "Enterprise vs Japan." 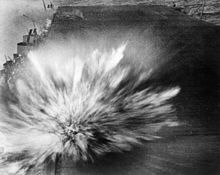 A Japanese bomb explodes on the flight deck of Enterprise on 24 August 1942, during the Battle of the Eastern Solomons, causing minor damage. Enterprise reached Nouméa, New Caledonia on 30 October for repairs, but a new Japanese thrust at the Solomons demanded her presence and she sailed on 11 November, with repair crews from Vestal still working on board. Part of the repair crew comprised a 75-man Seabee detachment from Company B of the 3rd Construction Battalion because adequate regular repair forces were lacking. [note 2] Underway with orders to engage the enemy, the Seabees continued their repair work even during the forthcoming battle. Ship repairs fell under the round-the-clock supervision of her damage control officer Lieutenant Commander Herschel Albert Smith, USN (USNA- Class 1922, Michigan). "She made the open sea with her decks still shaking and echoing to air hammers, with welders' arcs still sparking, with a big bulge in her right side forward, without water tight integrity and one oil tank still leaking, and with her forward elevator still jammed as it had been since the bomb at Santa Cruz broke it in half." The commanding officer of Enterprise, Captain Osborne Bennett "Ozzie B" "Oby" Hardison, USN (USNA- Class 1916, North Carolina) notified the Navy Department that "The emergency repairs accomplished by this skillful, well-trained, and enthusiastically energetic force have placed this vessel in condition for further action against the enemy". [note 3] This remarkable job later won the praise of Vice Admiral William Halsey, Jr., USN, Commander South Pacific Area and the South Pacific Force, who sent a dispatch to the OIC of the Seabee detachment stating: "Your commander wishes to express to you and the men of the Construction Battalion serving under you his appreciation for the services rendered by you in effecting emergency repairs during action against the enemy. The repairs were completed by these men with speed and efficiency. I hereby commend them for their willingness, zeal, and capability." On 13 November, aviators from Enterprise helped to sink the Hiei, the first Japanese battleship lost during the war. When the Naval Battle of Guadalcanal ended on 15 November 1942, Enterprise had shared in sinking sixteen ships and damaging eight more. The carrier returned to Nouméa on 16 November to complete her repairs. Sailing again on 4 December, Enterprise trained out of Espiritu Santo, New Hebrides, until 28 January 1943, when she departed for the Solomons area. On 30 January, her fighters flew combat air patrol for a cruiser–destroyer group during the Battle of Rennell Island. Despite the destruction of most of the attacking Japanese bombers by Enterprise planes, the heavy cruiser Chicago was sunk by aerial torpedoes. Detached after the battle, the carrier arrived at Espiritu Santo on 1 February, and for the next three months operated out of that base, covering U.S. surface forces up to the Solomons. Captain Samuel Ginder assumed command of the ship on 16 April. Enterprise then steamed to Pearl Harbor where, on 27 May 1943, Admiral Chester Nimitz presented the ship with the first Presidential Unit citation awarded to an aircraft carrier. En route to attack Makin Island on 10 November 1943, this Grumman F6F Hellcat (VF-2) crash landed on Enterprise's flight deck. Captain Matthias Gardner relieved Ginder on 7 November. Back at Pearl Harbor on 6 November, Enterprise left four days later to provide close air support to the 27th Infantry Division landing on Makin Atoll, during the Battle of Makin, from 19–21 November 1943. On the night of 26 November, Enterprise introduced carrier-based night fighters to the Pacific when a three-plane team from the ship broke up a large group of land-based bombers attacking TG 50.2. Two of the three planes returned to the ship, with LCDR Edward "Butch" O'Hare the only casualty. After a heavy strike by aircraft of TF 50 against Kwajalein on 4 December, Enterprise returned to Pearl Harbor five days later. The carrier's next operation was with the Fast Carrier Task Force in softening up the Marshall Islands and supporting the landings on Kwajalein, from 29 January-3 February 1944. Then, Enterprise sailed, still with TF 58, to strike the Japanese naval base at Truk Lagoon in the Caroline Islands, on 17 February. Again Enterprise made aviation history, when she launched the first night radar bombing attack from a U.S. carrier. The twelve torpedo bombers in this strike achieved excellent results, accounting for nearly one-third of the 200,000 tons of shipping destroyed by aircraft. Detached from TF 58 with escorts, Enterprise launched raids on Jaluit Atoll on 20 February, then steamed to Majuro and Espiritu Santo. Sailing on 15 March in TG 36.1, she provided air cover and close support for the landings on Emirau Island (19–25 March). The carrier rejoined TF 58 on 26 March, and for the next 12 days, joined in a series of strikes against the islands of Yap, Ulithi, Woleai, and Palau. After a week's rest and replenishment at Majuro, Enterprise sailed on 14 April to support landings in the Hollandia (currently known as Jayapura) area of New Guinea, and then hit Truk again from 29–30 April. On 6 June 1944, she and her companions of TG 58.3 sortied from Majuro to join the rest of TF 58 in attacking the Marianas Islands. Striking Saipan, Rota, and Guam from 11–14 June, Enterprise pilots gave direct support to the landings on Saipan on 15 June, and covered the troops ashore for the next two days. Aware of a major Japanese attempt to break up the invasion of Saipan, Admiral Spruance, now Commander 5th Fleet, positioned TF 58 to meet the threat. On 19 June 1944, Enterprise was one of four carriers of Task Group 58.3 under the command of Rear Admiral John W. Reeves' during the largest carrier aircraft battle in history: the Battle of the Philippine Sea. For over eight hours, airmen of the United States and Imperial Japanese navies fought in the skies over TF 58 and the Marianas. Over the course of two days, a total of six American ships were damaged, and 130 planes and a total of 76 pilots and aircrew were lost. In sharp contrast, American carrier aircraft, with a major assist from U.S. submarines, sank three Japanese carriers (Hiyō, Shōkaku, and Taihō), and destroyed 426 carrier aircraft, losses from which Japanese naval aviation would never recover. Enterprise participated both in the defense of the fleet and in the subsequent early-evening strike against the Japanese task forces. During the chaotic after-dark recovery of the air strike, a fighter and a bomber came aboard simultaneously, but fortunately did not cause an accident. A planned midnight strike against the Japanese fleet by night-flying Enterprise pilots was cancelled because of the recovery and rescue operations required after the dusk attack. 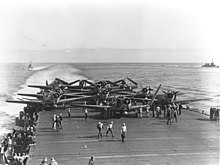 After the battle, Enterprise and her Task Group continued to provide air support for the invasion of Saipan through 5 July. She then sailed for Pearl Harbor and a month of rest and overhaul. During this time, Gardner was replaced by Commander Thomas Hamilton on 10 July before he was relieved in his turn by Captain Cato Glover on 29 July. Back in action on 24 August, the carrier sailed with TF 38 in that force's aerial assault on the Volcano and Bonin Islands from 31 August – 2 September, and Yap, Ulithi, and the Palaus from 6–8 September. After operating west of the Palau Islands, Enterprise joined other units of TF 38 on 7 October and set course to the north. From 10–20 October, her aviators flew over Okinawa, Formosa, and the Philippines, blasting enemy airfields, shore installations, and shipping in preparation for the assault on Leyte. After supporting the Leyte landings on 20 October, Enterprise headed for Ulithi to replenish, but the approach of the Japanese fleet on 23 October called her back to action. In the Battle of Leyte Gulf (23–26 October), Enterprise planes struck all three groups of enemy forces, battering battleships and destroyers before the action ended. The carrier remained on patrol east of Samar and Leyte until the end of October, then retired to Ulithi for supplies. During November, her aircraft struck targets in the Manila area, and at the island of Yap. She returned to Pearl Harbor on 6 December 1944 and Glover was replaced by Captain Grover B. H. Hall on 14 December. A photo taken from the battleship Washington shows an explosion on Enterprise from a bomb-laden kamikaze. The ship's forward elevator was blown approximately 400 feet (120 m) into the air from the force of the explosion six decks below. 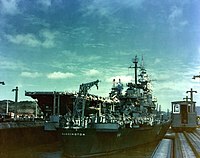 Sailing on 24 December for the Philippines, Enterprise carried an air group specially trained in night carrier operations; as the only carrier capable of night operations, she left Oahu with her hull code changed from CV to CV(N), the "N" representing "Night". She joined TG 38.5 and swept the waters north of Luzon and of the South China Sea during January 1945, striking shore targets and shipping from Formosa to Indo-China including an attack on Macau. After a brief visit to Ulithi, Enterprise joined TG 58.5 on 10 February 1945, and provided day and night combat air patrol for TF 58 as it struck Tokyo on 16–17 February. She then supported the Marines in the Battle of Iwo Jima from 19 February – 9 March, when she sailed for Ulithi. During one part of that period, Enterprise kept aircraft aloft continuously over Iwo Jima for 174 hours. Departing Ulithi on 15 March, the carrier continued her night work in raids against Kyūshū, Honshū, and shipping in the Inland Sea of Japan. Damaged lightly by an enemy bomb on 18 March, Enterprise entered Ulithi six days later for repairs. Back in action on 5 April, she supported the Okinawa operation until she was damaged on 11 April—this time by a kamikaze—and was forced back to Ulithi. Off Okinawa once more on 6 May, Enterprise flew patrols around the clock as kamikaze attacks increased. On 14 May 1945, she suffered her last wound of World War II when a kamikaze Zero, piloted by Lt. J.G. Shunsuke Tomiyasu, destroyed her forward elevator, killing 14 and wounding 34. The carrier sailed for and was fully repaired at the Puget Sound Navy Yard. Near ready, with all planes aboard at the degaussing/demagnetizing range off the Strait of Juan de Fuca when the Nagasaki bombing ended the war on 9 August 1945. Restored to peak condition, Enterprise voyaged to Pearl Harbor, returning to the States with some 1,141 servicemen due for discharge, including hospital patients and former POWs, then sailed on to New York on 25 September 1945 via the Panama Canal arriving on 17 October 1945. Two weeks later, she proceeded to Boston for installation of additional berthing facilities, then began a series of three Operation Magic Carpet voyages to Europe, bringing more than 10,000 veterans home in her final service to her country. With the commissioning of over two dozen larger and more advanced aircraft carriers by end of 1945, Enterprise was deemed surplus for the post-war needs of America's navy. She entered the New York Naval Shipyard on 18 January 1946 for deactivation, and was decommissioned on 17 February 1947. In 1946, she had been scheduled to be handed over to the state of New York as a permanent memorial, but this plan was suspended in 1949. Subsequent attempts were made at preserving the ship as a museum or memorial, but fund-raising efforts failed to raise enough money to buy the vessel from the Navy, and Enterprise was sold on 1 July 1958 to the Lipsett Corporation of New York City for scrapping at Kearny, New Jersey. A promise was made to save the distinctive tripod mast for inclusion in the Naval Academy's new football stadium, but was never fulfilled; instead, a memorial plaque was installed at the base of what is still called "Enterprise Tower." Scrapping was complete as of May 1960. In 1984, a permanent "Enterprise Exhibit" was dedicated at the Naval Aviation Museum, Naval Air Station Pensacola, Florida to house artifacts, photos and other items of historical interest. The stern plate of USS Enterprise located in River Vale, New Jersey. Surviving Enterprise artifacts include the ship's bell, which resides at the U.S. Naval Academy, where it is traditionally rung only after Midshipmen victories over West Point; and the sixteen-foot, one-ton nameplate from the ship's stern, which sits near a Little League park in River Vale, New Jersey. Her commissioning plaque and one of her anchors are on display at the Washington Navy Yard in Washington, D.C. The name was revived in February 1958 when the world's first nuclear-powered aircraft carrier was laid down as the eighth Enterprise; this ship was commissioned in November 1961. Also nicknamed the "Big E", various artifacts and mementos were kept aboard from her predecessor. The port holes in the captain's in-port cabin and conference room are only one example. She was inactivated and removed from service on 1 December 2012 after being in the fleet for 51 years. Due to considerations arising from reactor removal, she cannot be turned into a memorial. At her inactivation, it was announced that the ninth ship to bear the name Enterprise would be the planned Gerald R. Ford-class aircraft carrier, CVN-80. It has not been confirmed what, if any, artifacts from USS Enterprise (CV-6) will be incorporated into this next generation aircraft carrier, although a time capsule containing mementos from both CV-6 and CVN-65 will be presented to the first captain of the new Enterprise. The aforementioned port holes aboard the CVN-65 will be removed and returned to the Boston Navy Yard Museum. For consistently outstanding performance and distinguished achievement during repeated action against enemy Japanese forces in the Pacific war area, 7 December 1941, to 15 November 1942. Participating in nearly every major carrier engagement in the first year of the war, the Enterprise and her air group, exclusive of far-flung destruction of hostile shore installations throughout the battle area, did sink or damage on her own a total of 35 Japanese vessels and shot down a total of 185 Japanese aircraft. Her aggressive spirit and superb combat efficiency are fitting tribute to the officers and men who so gallantly established her as an ahead bulwark in the defense of the American nation. In addition to her Presidential Unit Citation, Enterprise received the Navy Unit Commendation and 20 battle stars for World War II service, making her the highest decorated US ship ever. Finally, she was presented with a British Admiralty pennant that was hoisted when a majority of the Admiralty Board members were present. The pennant was given to Enterprise as an unofficial token of respect from an ally. Gene Roddenberry, creator of the television show, Star Trek, named the fictional starship used in the show, Enterprise in honor of CV-6. ^ Saratoga was undergoing repairs at Pearl Harbor after being torpedoed by a Japanese submarine, while Ranger (which had been judged unusable for combat operations) was still assigned to the Atlantic fleet. ^ Each Seabee battalion comprised 4 construction companies of 224 men each, one headquarters company comprised 169 men, and a maintenance detachment consisted of 275 men. Also, 3rd Construction Battalion history is at this web site. ^ Captain Hardison was in command (21 October 1942 – 7 April 1943). Completed naval career as Vice Admiral. Born (22 December 1892), died (16 February 1959, age 66, due to wounds from an automobile accident in Washington DC), buried in Arlington National Cemetery (section 2, site E-4 Rh). The collection of the Osborne Bennett Hardison naval papers (1912–1954) are maintained at the University of North Carolina Louis Round Wilson Special Collections Library (collection no. 03554). A summary of this collection is at this web site. ^ During the first year of the war, both of Enterprise's sister ships (Hornet and Yorktown, as well as the similar but smaller carrier Wasp), were sunk by torpedoes. ^ "USS Enterprise (CV-6)". National Museum of the U.S. Navy. 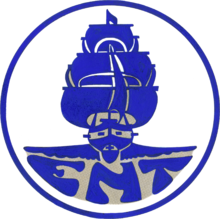 Naval History and Heritage Command. Retrieved 9 November 2018. ^ a b c d e f g h i j k l m n "Enterprise (CV-6) vii 1938-1947". Dictionary of American Naval Fighting Ships. Navy Department, Naval History and Heritage Command. 17 December 2014. Retrieved 10 April 2015. ^ a b "Call to Duty". Battle 360°. Episode 1. 29 February 2008. History Channel. ^ Chant, Christopher; Davis, John F. (1974). The Encyclopedia of Air Warfare. Salamander Books, Ltd. ISBN 0 690 00606 3. ^ Stafford, Edward P., "The Big E: The Story of the USS Enterprise", Bluejacket Books, Naval Institute Press, Annapolis, Maryland, 1962/2002, LCCN 2001057951, ISBN 1-55750-998-0, pp 42-43. ^ Trumbull, Robert (1942). The Raft. New York: Henry Holt and Co.
^ "Where are they now?". Newsweek Magazine. 8 February 1954. ^ Parshall, Jonathan; Tully, Anthony (2007). Shattered Sword: The Untold Story of the Battle of Midway. Potomac Books. ISBN 1574889249. ^ Ewing, Steve (2002). Reaper Leader:The Life of Jimmy Flatley. Naval Institute Press. ISBN 1557502056. ^ Shepherd, Joel. "USS Enterprise CV-6 - 1942". www.CV6.org. Retrieved 7 January 2015. ^ "USS Enterprise CV-6". Pacific Wrecks.com. 27 August 2014. Retrieved 7 January 2015. ^ "Battles - USS Enterprise". www.theussenterprise.com. Archived from the original on 28 April 2015. Retrieved 7 January 2015. ^ "Enterprise versus Japan". Battle 360°. Episode 5. 29 March 2008. History Channel. ^ "24: Bases in the South Pacific". Building the Navy's Bases in World War II: History of the Bureau of Yards and Docks and the Civil Engineer Corps, 1940–1946. II. Washington DC: United States Government Printing Office. 1947. pp. 221–222. ^ Stafford, Edward P. (1962). "XIII: The Slot". The Big E: The Story of the USS Enterprise. Annapolis MD: Naval Institute Press. p. 214. ISBN 1-55750-998-0. ^ Leckie, Robert (1965). "Part V - Crux, chapter 2,". Challenge For the Pacific: The Bloody Six-Month Battle of Guadalcanal. New York: Perseus Book Group. p. 321. ISBN 0-306-80911-7. ^ Shepherd, Joel. "Commanding Officers". www.CV6.org. Retrieved 7 January 2015. ^ Stafford, Edward P. (1962). The Big E: The Story of the USS Enterprise. Annapolis MD: Naval Institute Press. p. 546. ISBN 1-55750-998-0. ^ Seabees Repair Carrier During Sea Battle (Technical report). News Letter Bureau of Aeronautics Navy Department. 1 February 1943. pp. 15–16. 187. ^ Shepherd, Joel. "USS Enterprise CV-6: 1944". www.CV6.org. Retrieved 4 June 2012. ^ "The Empire's Last Stand". Battle 360°. Episode 10. 2 May 2008. History Channel. ^ Garrett, Richard J. (2010). The Defences of Macau: Forts, Ships and Weapons Over 450 Years. Hong Kong University Press. p. 138. ISBN 9888028499. ^ Lane, Richard. "Examination of Japanese Aircraft Aileron Tip USS Enterprise (CV-6), 11 April 1945". j-aircraft.com. Retrieved 7 January 2015. ^ a b c "USS Enterprise CV-6 The Most Decorated Ship of the Second World War". ^ "USS Enterprise (CV-6) damages". The New York Times. 25 December 1945. ^ Friedman, Norman (1983). U.S. Aircraft Carriers: An Illustrated Design History. Naval Institute Press. p. 100. ISBN 0870217399. .
^ "USS. Enterprise Ships Bell in front of Bancroft Hall at the U.S. Naval Academy in Annapolis, Maryland". dcmemorials.com. Retrieved 7 January 2015. ^ Shepherd, Joel. "Enterprise CV-6 Stern Plate". www.CV6.org. Retrieved 7 January 2015. ^ "Navy's Next Ford-Class Aircraft Carrier to be Named Enterprise" (Press release). US Department of Defense. 1 December 2012. Retrieved 7 January 2015. .
^ Shepherd, Joel. "Decorations-Presidential Unit Citation". www.CV6.org. Retrieved 7 January 2015. A film of the attacks on Enterprise on 24 August 1942. The film was taken by 2nd Class Marion Riley, who operated a motion picture camera from the aft end of the ship's island, above the flight deck.